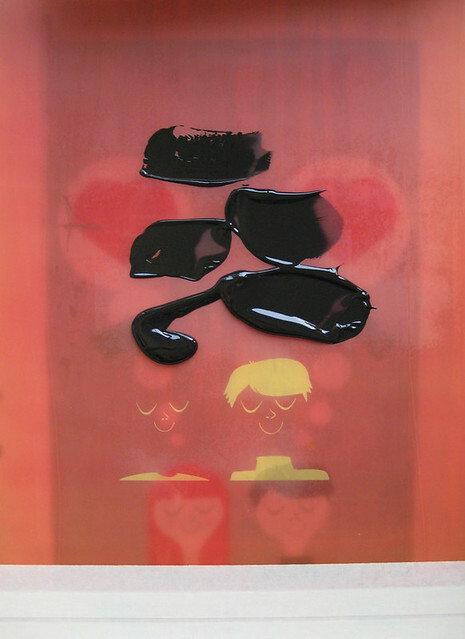 "Thinking Of You", new 3-color hand silkscreen printed art print for the MS150 Screens''n'Spokes art show & team. Click for more info & to purchase. 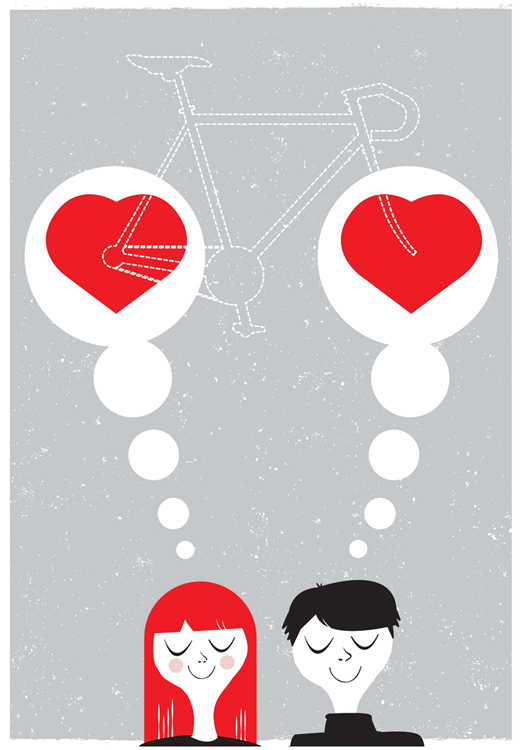 If you love your bike and you love your love, and you both love bicycles? Well, this is the print for you! “Thinking Of You” is our 2011 contribution to the amazing Screens’n’Spokes (aka S’n’S) MS 150 Team and we couldn’t be more thrilled to be a part of their efforts and art shows again this year to help raise awareness and money for the National Multiple Sclerosis Society. In just 5 years, the Screens’n’Spokes Team has raised over $200,000 to benefit the National Multiple Sclerosis Society through enlisting top printmaking artists to create new art prints for sale through the S’n’S annual art show and their Etsy Shop. Once again this year S’n’S will be organizing a month long art show in Philadelphia with hand printed art work from over 15 Gig Poster artists. Mugshots CoffeeHouse on Fairmount has graciously hosted S’n’S for all five seasons. 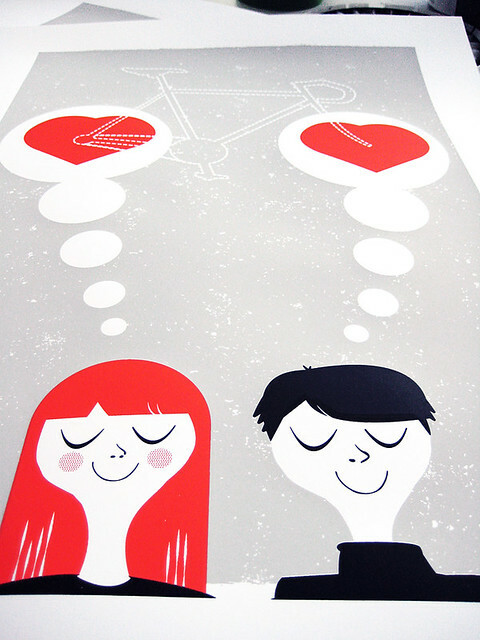 “Thinking of You” is our 3-color, all hand silkscreen printed art print, carefully printed one layer at a time, with soft cloud grey, bright love red, and black hand-mixed and non-toxic water based silkscreen inks. Edition of 200. Size: 16 x22 inches (39.4 cm x 55.9 cm.) Paper: no acid, archival Cougar, White 100lb cover weight. This new art print is now available for sale in a bunch of places for your convenience too. 1. The Screens’n’Spokes Etsy shop here where all proceeds from the sale of any prints benefits the MS Society. 2. From our website here, with a portion of each sale going to the MS Society. 3. From our own Etsy shop here with a portion of each sale going to the MS Society. 4. From the show itself at Mugshots in Philadelphia in the lovely Fairmount section of the city with a portion of each sale going to the MS Society. This is a limited edition print, so once it’s gone, it’s gone baby! Below are some photos of the hand silkscreen printing process, and feel free to hop on over to our Flickr page where tons more process photos live! 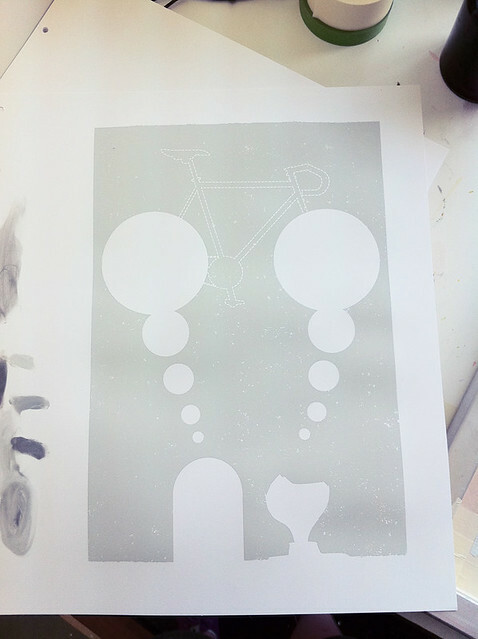 "Thinking Of You" art print process: 1st color (grey) printed. Click for more info & more process photos of the silkscreen printing process. 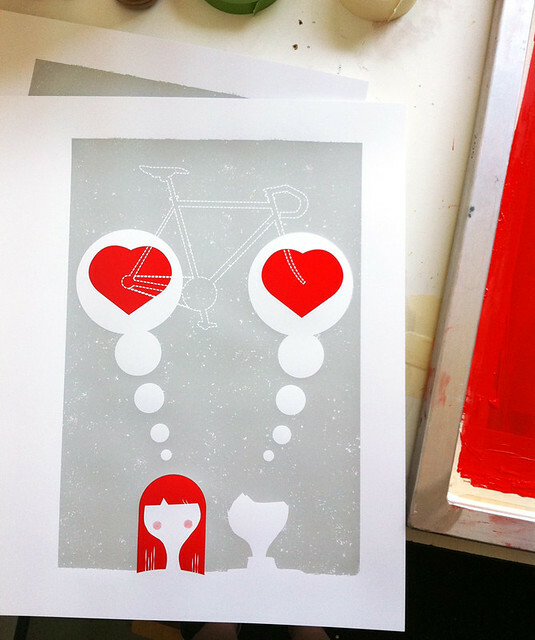 "Thinking Of You" art print process: 2nd color (red) ink on the screen, ready to go. 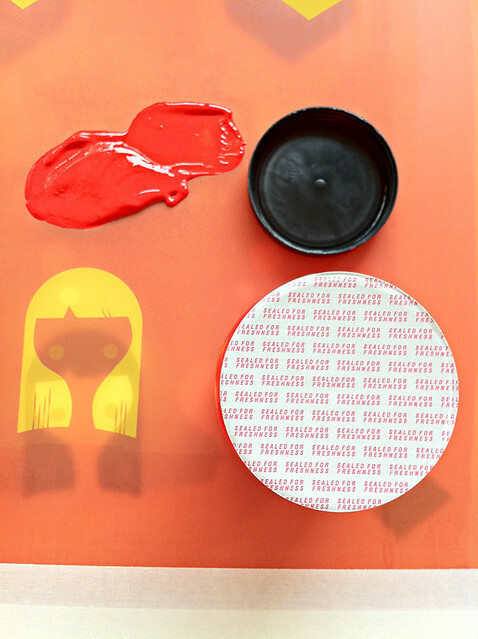 Click for more info & more process photos of the silkscreen printing process. "Thinking Of You" art print process: 2nd color printed. Click for more info & more process photos of the silkscreen printing process. "Thinking Of You" art print process: 3rd & final ink layer (black) ready to print. Click for more info & more process photos of the silkscreen printing process. "Thinking Of You" art print process: 3rd color printed & done. Click for more info & more process photos of the silkscreen printing process.